explore its wildlife. A home to some of the finest wildlife destinations, this state has always fascinated me. I went there purely for a wildlife holiday and came back ‘completely overwhelmed’. 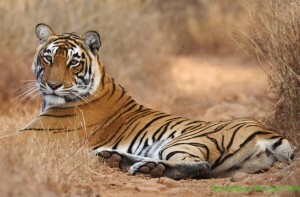 My first halt was the royal Ranthambore National Park, a home to the ferocious tigers and a variety of other wildlife. Encompassing an impressive 1,334 sq km of land, the Park is located in the Sawai Madhour district of Rajasthan. 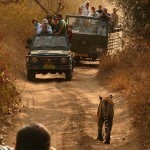 The Park is divided into five zones and we were in the third zone, which offers bright chances of sighting a tiger. The path to this zone is lined with dry dhok, thokra, mango, supari and imli trees. We saw many langurs jumping from tree to tree as if flaunting their fitness like this. They seemed to be least bothered by our presence. 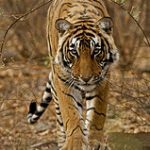 My most memorable moment inside the Park was when I caught sight of a tiger at the Padam Talao( the first and the largest of three lakes inside the third zone). The tiger was busy quenching his thirst. Sensing our presence, the tiger turned back and looked at us for a few seconds and then made his way deep into the forest. It was a sight that will always remain in my memory. My joy knew no bounds as I saw the tiger from close quarters. As I and K.P Singh, my guide meandered our way into the Park, we were rewarded with the sights of sloth bear, wild boar, monitor lizard, sambar, mongoose, nilgai and porcupines. I was feeling elated as fortune was on our side. «Next Post Palaces of Rajasthan- Relax In The Lap Of Luxury!